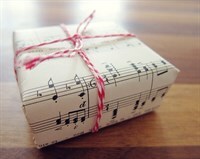 Give the gift of music! This is a long-term investment in your child's well-being and healthy development. Plus, it doesn't clutter up your house! So tell grandparents. Our gift certificates come in various denominations, and are good for classes offered by Music and Movement of Newton. Gift Certificate for a full semester of music classes!